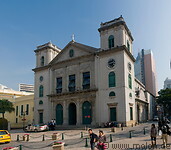 The old town of Macau consists of Portuguese colonial era buildings and streets and has a distinct Mediterranean flavour. 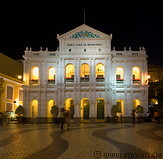 The old town is centered around the Largo Senado square, a longish square with a fountain and several interesting historical buildings. The area is dominated by the mount fortress, which nowadays hosts the Macau museum. Nearby there are the ruins of the St Paul's cathedral, of which only the facade is left.